This presentation was presented at the Higher Degrees Week - Flinders University, Faculty of Health Sciences, School of Nursing and Midwifery as a progress seminar for my PhD studies. Disasters disrupt the normal functioning of a community resulting in an increased demand for health services. The literature pertaining to the experience of Australian nurses assisting in the out-of-hospital disaster environment is primarily descriptive of single events and does not include a phenomenological perspective. The aim of this research was to gain insight into what it may be like Being an Australian civilian in-hospital nurse working in the out-of-hospital disaster environment. Phenomenology as a method was used in this research, which is concerned with the essence of things as they are appearing in the conscious awareness of the first person. Narrative was obtained from eight participants using semi-structured interviews at two points in time. From the participant narrative, moments of their lived experience included; on the way to the disaster, prior to starting work, working the shift, end of the shift and returning home. From the lived experience description a reflection was undertaken against the phenomenological existentials of spatiality, corporeality, communality, and temporality. The existential theme of temporality emerged strongly. The lived experience description and existential reflection provide insight into what it may be like Being an Australian civilian in-hospital nurse working in the out-of-hospital disaster environment. This in turn, may inform future education, research, clinical practice and health policy related to nurses in the out-of-hospital disaster environment. Ranse J. (2016). 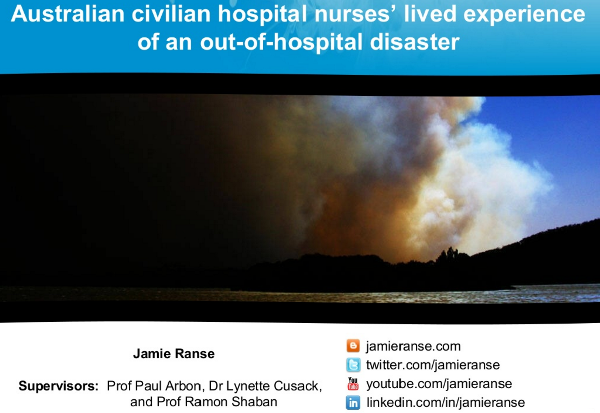 Australian civilian hospital nurses’ lived experience of an out-of-hospital disaster; presentation at the Higher Degrees Week - Flinders University, Faculty of Health Sciences, School of Nursing and Midwifery. Adelaide, South Australia, 30th June.